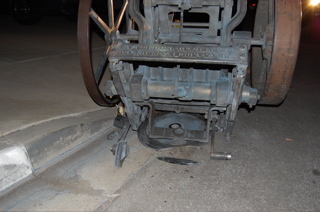 Tonight I eagerly awaited the delivery of my first letterpress - until the freight company that I hired literally DROPPED IT in front of our house. Do not use freightquote.com!!! They are an eBay affiliate so I thought I could trust them, but boy was I wrong. 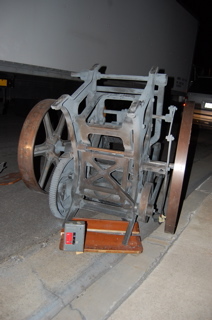 It arrived unstrapped in a box truck and they attempted to unload it on a tiny pallet jack - with only one person! The guys who’s delivered it were contractors of freightquote.com (United California Freight Solutions) and they had absolutely no idea of what they were doing. It broke into a bunch of pieces on impact and the shaft was severely bent. 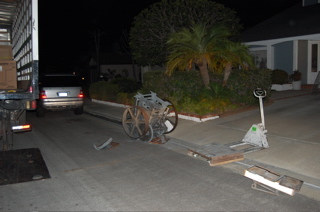 My father and I worked for 5 hours trying to upright the thing (even tying a rope to our car) with the guy that “dropped” it off. They are supposed to be the professionals right? That’s what I paid for!!! I’m so disappointed. I was so excited to get this press - now I have to see if I can get my money back from these guys and then try and find another press. A beautiful, nearly 100 year old machine destroyed by negligence - arrrrggghhhh!!!! If I could take back time, I would have moved it myself…attached are some pics of the disaster as it unfolded. That is really too bad. I am sorry for your loss. I can only imagine how many other fine machines have been lost like this over the years. Best of luck getting reimbursed, hopefully your enthusiasm will be rewarded in the end. Oh, that is terrible. What a mess. I hope you get a refund, and I hope you had insurance. Please don’t let this mishap derail your desire to print! p.s. I don’t think freightquote.com is affiliated with eBay—UShip.com, another way to gather bids from independent shippers, is linked with eBay, but not freightquote, as far as I know. Very sad. I have moved several presses, without problems. The easiest way is to call a tow truck with a winch. The winch can be used to lift one onto the truck, or off, in a few minutes. Normally, they use a heavy nylon towing strap, threaded through the frame of the press. Easy does it. It might be wise to remove as many reusable parts as you can. Other people will pay for them to restore presses that have been broken. The rest can be scrapped. Cast iron is worth money. I believe Freightquote.com is indeed affiliated with eBay. They are the service that eBay uses to allow quotes for freight shipments on heavier auction items. I am not sure how you go about getting a refund here, but Freightquote.com is notorious for being very helpful when it comes to selling you something and very UNhelpful when it comes to dealing with refunds, changes, etc. If you purchased the item through eBay I would contact them and see what they say. How in the world did they manage to get it on the truck in the first place? Was this shipped a great distance? The seller really should have put the press on a pallet and bolted it down. But nothing is going to compensate for the liftgate being way too shallow to hold a press… especially one teetering on a pallet jack. Like Kevin said, take off whatever parts are not damaged. It looks like the ink disk is a loss, but there are several other parts that people will pay good money for. I’m not sure what you paid for shipping, but I’m guessing you could make a few hundred dollars in spare parts alone. Let’s hope that you get this matter resolved and you are able to get another press sooner rather than later. If you are in California (Irvine) you should have absolutely no trouble finding someone capable of moving these machines in the future. Maybe even some of the members of this sire would volunteer to help for as little as a meal and a drink. Enthusiasts are always willing to help fellow enthusiasts. Don’t beat yourself up over it, it’s a lesson learned and a mistake you’ll never make again. These presses can often be found at very low prices—it’s moving them that ends up costing. That’s really sad! It’s hard to tell from the photos what size press it is (10x15? ), but there are lots of 10x15 and 12x18 new-style C&P presses around that have been used for die-cutting and have badly-worn bearings. 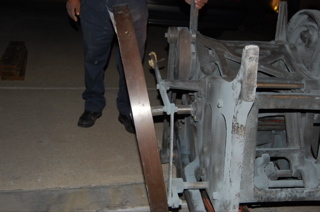 If you could find one that was being scrapped for that reason you could probably get the broken parts of this press off of it — none of the damaged parts, it appears, would have been affected adversely by die-cutting. It looks like you need the roller arm assembly, the feed table supports, the flywheel shaft, and the ink disc, at the least. Just be sure there’s no frame damage. I mourn your misfortune - and our collective loss. Ouch. Sorry to see that happen. What did he say or do after it fell? Did they mention anything about compensation or policy after something like this happens? Hopefully, it was insured and you can get your money back. In the meantime, keep on learning the craft. That is really a shame. I hope that you get your money back and then find an even better press. Salvage what you can and get looking for a new one. Someone could have been killed, or crippled for life, when that baby got away from the driver. As sad as this incident is, it could have been much worse. May she rest in peace. Not in pieces, but in remembrance of the impressions that passed between her strong and capable jaws. The notices of weddings, and of war, of carnivals, and of carnage. Therefore ask not for whom the clank of the pawl upon the ratchet of the ink platen rings. It rings for thee. … or something like that. Amen. Oh my goodness. I really feel for you here. I think I would’ve killed the delivery guy, personally, so congratulations on not doing that yourself (unless you failed to mention that bit). I just had a company over here move my two 10 x 15” C&Ps and my heart was in my mouth the entire time, until they were finally sitting in the studio. I had visions of what could happen - they looked just like these photos. Anyone have suggestions for moving a 10 x 15” C&P? I’m fearful of this very same thing happening to me. Many thanks in advance. Where are you, how far do you have to move the press, any challenges like basement steps, etc? Recommendations for moving a press will vary depending on all these factors, but probably the best thing is to get someone with experience moving similar presses if at all possible. I don’t move very many presses, only about a dozen last year, and other people will have different advice. But I like the simple use of pipe rollers under wood skids (2x6, 3x6, or 4x4 for a 10x15 press) that the press is bolted to. 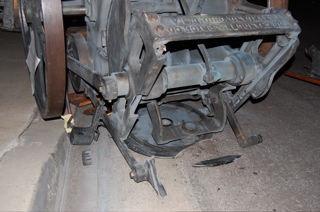 A small hydraulic jack (a bottle jack is fine) under one end of the press, off-center toward the flywheel, will easily lift it enough to get rollers under, while keeping the other ends of the two skids on the ground. Once on rollers, the press can be rolled into a hydraulic drop trailer, taken off the rollers, and tied down for travel. At the destination the press is again put on rollers to move into the shop. Just remember that platen presses are quite topheavy, and this technique basically avoids getting them “up in the air” further than the diameter of the rollers. Well, there’s destroyed and destroyed. You did note on the freight bill that driver dropped and destroyed press I hope, that’s the first place to start. You will likely have to fight the truck line—not freightquote for a claim, do that now. These photos are a good starting point for that. As far as the press…… Amazingly, the flywheel looks intact, If this is a straight shaft New Series press, a machine shop can either straighten the existing shaft, or machine a new one. You will need a new ink disk—probably cheaper than a repair, , but the left side roller arm (the break by the Redington counter) may be able to be brazed up). The thowoff looks good and none of the legs were damaged (can’t tell from pictures). I have a 10 x 15 OS that have something similar happen to it (brazes on the throw off handle, the right ink rail at the top of the bed, and a couple other places. It is fixable, and it is probably easier to fix than it looks. Contact the folks in the SF area and they’ll certainly be able to help. I wouldn’t give up on this one, but I’d certainly give the freight/trucking company hell. I am sorry to hear that. I suppose now it is real scrap metal. 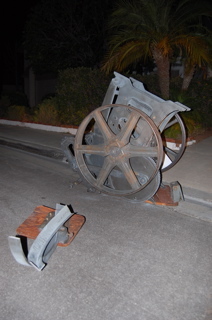 I suppose some parts may be recovered to save another press. my heart is in pain looking at the photos. reminds me of an incident some 5 years ago; not as much as similar to this one. when we moved, i was in orlando with my family and my partner calls me just in time we were about to enter the theme park. i said what? he says the 10x15 C&P cannot enter inside the building. i don’t know what i said but he told me when i got back that i said “then throw it away!” i called the moving people and i asked them where. they said they dropped it off at a metal recycling center. they must gotten a hefty amount considering its weight! i wish i knew the briar press at that time so i could have it dropped off at the back and have one of the briarpress community member come and take it away to a better home than a dump! Just completed moving a 8x10 C&P down into my basement. The only thing that broke is the lever that spins the inking disk. I consider myself lucky! I named my shop “Thousand Pound Press” because I felt every pound of it trying to get the thing out of a basement. It hurts my heart to hear of another C&P going into a basement. Best of luck to you, ddamico, but even more luck to the poor soul that one day acquires that press from you.